Is Google’s Knowledge Graph Troubling Companies? Google has been trying to improve search with its knowledge graphs since May 2012, but predictive search still has a long way to go. Google knowledge graphs are still as inadequate as they could be, and early stage experiments can prove costly. Earlier this month, I got an irritated phone call from a friend who works with a Fortune 500 company, ranting about Google’s recent goof-up that caused an unwanted commotion in their system. Google’s knowledge graph, which shows higher than any of your own pages (usually at level with Google ads) and seems like a reliable source, was displaying an incorrect phone number for the company, causing hundreds of calls to be directed to the wrong place. Google displayed the company’s Canada phone without indicating anyhow that this call would go to Canada. Since the number was a toll-free (1800… ) there was no way anyone could have guessed it. But as soon as it started showing up in the Google’s knowledge graph, the company’s Canada phone started to buzz at an unusually high rate only for the call-executives to figure these calls were all misdirected. Add to that, the frustration of users on having dialed the wrong place. The company in question is Stryker Corp. – a fairly large business that gets hundreds of phone calls an hour. The first reaction at their office was of perplexity as they could not see why suddenly everyone is calling the Canada number instead of the usual US one. Once they figured out it was for the wrong information in the knowledge graph, they started looking for ways to have it corrected. But unfortunately, the search giant doesn’t allow you to edit the info in the knowledge graph, which is basically a compilation of what they “think” you are looking for. Also, they don’t reveal how they select the information to display (although it seems to be mostly from your business listings), so there is no way you can control that. There is an option for feedback, but my experience with feedbacks to Google has been highly disappointing in the past, and once again, the feedback submitted went in vain. 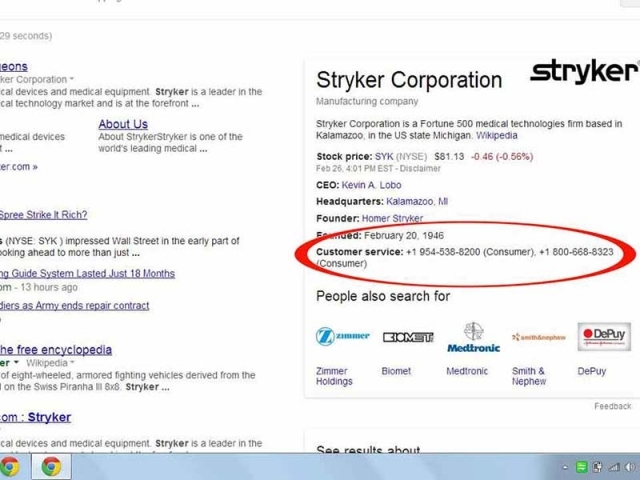 On approaching them through Google product forums—perhaps the quickest way to contact Google about such discrepancies—Stryker managed to get the information updated after suffering the ordeal of miscalculation for about 20 days. Late last year, Union Bank had faced a similar trouble with Google’s knowledge graph displaying incorrect customer service number. After they raised complaints, Google has completely removed the contact info for both companies from its knowledge graph for good, but these experiments at Google’s end can prove expensive for businesses. Dear Google, we don’t like mediators, especially the ones that distort the facts. It can easily cause an unnecessary chaos as in the case of Stryker. While wrong display of contact information can prove expensive for any company, Google’s knowledge graph has not been well received by webmasters even where the information is right for it causes the actual source to lose out on the traffic. I can’t say if they can always and accurately predict what you are exactly looking for. And if the knowledge graph is not accurate, does it make sense for Google to put it higher than our own websites that are likely to have more reliable information?